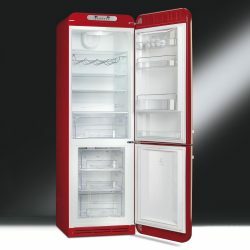 The Smeg FAB32LNR fridge is a very unique “inverted” offering, where the freezer is at the top with a fridge below. Included is a guaranteed no-frost freezer that features two drawers on the bottom, making it much easier to organise things. One of the drawers is a fast freeze drawer, which is great for meat storage. The fridge half is incredibly organised, with three adjustable glass shelves, a separate fruit and veggie container, a covered storage box, and a chrome wine rack. It’s also very aesthetically pleasing, with smooth, curved edges that give it a retro feel, while still being very modern both in style and technological advances.